Come and see our Technical Presentation at North America’s leading energy event in June 12-14, 2018 at Stampede Park, Calgary, Canada. Our CEO, Gordon Stove, presents Adrok’s latest technology developments in measuring subsurface temperature at the AEGC2018 conference in Sydney, Australia. These new breakthrough ADR technologies have beneficial applications in finding sources of geothermal heat and for monitoring steam injections for Enhanced Oil Recovery applications. Adrok are delighted to announce that we’ve been awarded the Investors In People Silver accreditation, acknowledging our commitment to leading and supporting the people we work with. 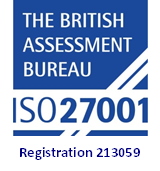 Additionally, we’ve also recently achieved ISO9001 and ISO27001 certification, recognising our standard of quality and security management. The Rushlight Summer Showcase will see Adrok & IGas present at the Innovate UK Energy Catalyst Round 3 Showcase at the Royal Geographical Society, London. We’re delighted to announce Adrok has moved up to second place in the UK’s 2017’s Intellectual Property League Table,IP100. Adrok was ranked 5th in 2016’s first ever UK IP100 table. We will be presenting a Technical Poster at this year’s Petex 2016 event in London on Wednesday 16th November 2016 (https://www.petex.info/) Download programme here. Adrok are delighted to be participating in this event in Banff, Canada http://www.uptechbanff.com/ . If you are interested in meeting with us there, please get in touch revolution@adrokgroup.com. 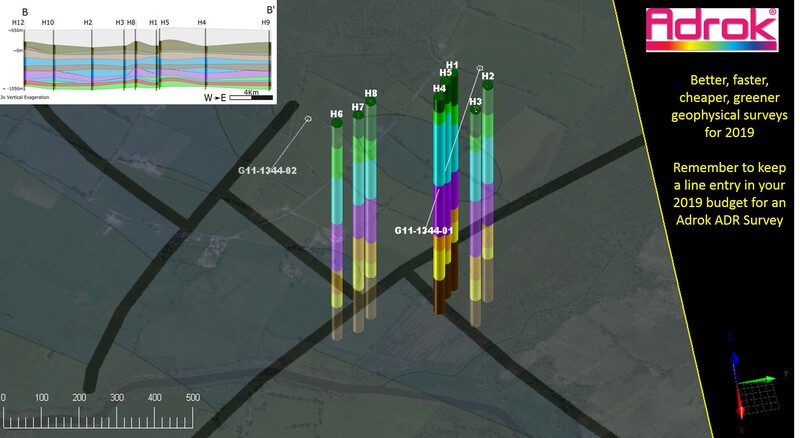 Energy Catalyst – Early Stage Feasibility – Round 3 Project for innovative remote sensing to increase onshore UK gas production commences. Download project description here. Our Chief Scientific Officer, Dr Kees van den Doel, will be presenting a paper at EAGE2016 in Vienna on 1st June 2016 in the Innovative Technologies session. We are pleased to announce that Adrok have been selected to go live with our “Pitch to Rich 2015” entry with Virgin. Please follow the link below to vote for us! Come and meet us Down Under at Booth 69 at the 24th International Geophysical Conference and Exhibition, Perth, Western Australia 15 to 18 February 2015. 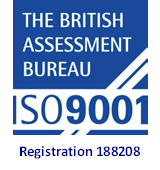 Also hear us give a Technical talk and hear from one of our Australian Client’s experiences of using our Survey Services and technology on Tuesday 17 February 2015. Come and hear Adrok’s Technology Presentation in collaboration with the University of British Columbia and Teck Resources at the SEG 2014 Annual Meeting in Denver on 30th October 2014 at 10:10am in the MG2 New Methods and Developments session. http://seg.org/ 10:10 AM….. 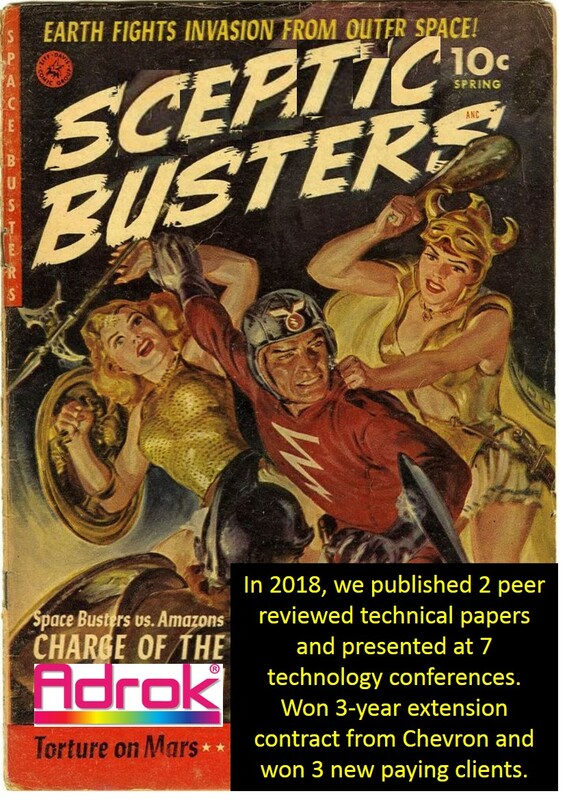 Ground penetrating abilities of broadband pulsed radar in the 1-70MHz range — K. van den Doel *, U. of British Columbia; J. Jansen, Teck Resources Limited; M. Robinson, G. C, Stove, and G. D. C. Stove, Adrok Ltd. (MG 2.5) (INT. AUD. : 3). We are delighted to announce that we have an Adrok team raising money for the Prince’s Trust charity in this year’s Prince’s Trust Million Maker’s Challenge (Charity Registration No. 1079675). The Trust aims to support 58,000 vulnerable young people, helping to give them the skills and confidence to find a job. Adrok’s CEO has been a mentor for The Prince’s Trust for over a year and as a part of Adrok’s in-house team building exercise he introduced them to a process called Million Maker. The team presented their plan to a ‘Dragon’s Den’ style team as to how they would raise £10,000 on top of £1,500 of sponsorship from the Dragons. We would be grateful if you could pledge your generous support at: https://www.justgiving.com/Adrok-MMakers/ or by texting ARMM99 £5 (money amount) to 70070 from your mobile phone. (Please note that the collections will expire on 31st January 2015.) Thanking you kindly! Download our letter of authority. Adrok awarded Investors In People Accreditation in recognition of the way Adrok treats, trains and values its team of “Adrokers”. Come and visit Adrok at booth 1401 at the Atlantic Canada Petroleum Show 2014 in St John’s, Newfoundland. Adrok presents technical presentation at North Atlantic Craton Conference 2014 at the University of St Andrews. The event was organised by the Cardiff and St. Andrews University Chapters of the Society of Economic Geologists, and the Applied Mineralogy Special Interest Group of The Mineralogical Society of Great Britain and Ireland, in conjunction with the British Geological Survey and Geological Survey of Denmark and Greenland. Adrok makes encouraging progress with applying its Atomic Dielectric Resonance technology to searching for Gold with Australian Gold Exploration Company, Citigold, as reported in Citigold’s latest Quarterly Report. Adrok, the Scottish developers of a deep subsurface scanner used in the exploration of minerals and oil and gas, has further boosted its board with the appointment of a mining finance expert. Investment analyst Willie McLucas, a well-known fundraiser in the global junior mining sector, has joined Adrok as a non-executive director and will advise on global mining opportunities. Last month, Adrok also appointed oil and gas entrepreneur Alan Faichney as a non-executive director. Adrok, the developers of a revolutionary subsurface scanner oﬀering a greener, faster and cheaper way to explore for resources, are challenging the industry to be ‘less boring’ with the launch of its new marketing strategy. The ‘It’s less boring with Adrok’ campaign highlights the major cost and environmental beneﬁts of using the company’s innovative scanner to explore for oil&gas and minerals. Adrok, the Scottish developers of a deep subsurface scanner used in the exploration of minerals and oil and gas, have bolstered their board with the appointment of one of the oil industry’s most respected businessmen as Non-­‐Executive Director. Alan Faichney, who has a held a number of key technical and strategic roles in the aerospace and exploration industries throughout his career, willwork with Adrok to help them build on their recent global successes. The Scottish developers of a deep subsurface scanner offering a faster, cheaper and greener alternative to traditional seismic exploration methods, are expanding operations with a new Canadian office. Adrok Canada will provide a base to service existing clients in the region as well as develop business within the country’s booming mineral exploration industry. Gordon Stove, Managing Director of Adrok, is one of 29 Scottish business leaders in the running to be named Ernst & Young Scotland Entrepreneur Of The Year 2013. The Scottish developers of a deep subsurface scanner, offering a faster, cheaper and greener alternative to traditional seismic exploration methods, have opened a base in Houston, Texas. Adrok Geosciences will focus on working with the exploration and prospecting industry in the US and Canada. http://archives.aapg.org/longbeach2012/ – Wed 25th April, 2012 Come and learn about Adrok’s latest technology developments at the AAPG2012 conference in California, USA. Our presentation can be found in the Technical Program under Theme 10: Geophysics and Seismology – Microseismics, Electromagnetics and Remote Sensing on Wednesday 25th April 2012 at 2:20pm in Oral Room 104 C.
Edinburgh-based technology company Adrok Ltd today announced an investment of more than £3 million from key client, Teck Resources Limited – a Canada-based diversified resource company committed to responsible mining and mineral development with major business units focused on copper, steelmaking coal, zinc and energy. Tuesday 15th November, 2011. Adrok is presenting at this prestigious conference organised by the Mining Institute of Scotland (MIS) and the Central Scotland Regional Group of the Geological Society at the British Geological Survey in Edinburgh. www.kansasnextstep.org – Thursday 4th August, 2011 Adrok is delighted to be presenting at the Kansas Next Step 2011 Oil & Gas Seminar at the Fox Pavillion, 1202 Main Street, Hays, Kansas, following a personal invitation from their Executive Director. Earls Court 2, Warwick Road, London, UK, on Thursday 25 November 2010 Attend Adrok’s presentation on Applied Technology in Hall 1 at 12:05pm (www.petex.info). Adrok at the Society of Exploration Geophysicists International Exposition & 80th Annual General Meeting (www.seg.org) Booth 2572 in Hall C of the Colorado Convention Centre, Denver, Colorado USA. A syndicate of oil investors discover oil on a prospect in Oklahoma, USA, where Adrok’s ADR Scanner had previously demonstrated would contain commercial oil. Adrok’s depth prediction to the main hydrocarbon zone was accurate to 0.3%. Oil was discovered at 7,100ft below ground level in the Wilcox formation. Adrok successfully pass field trials onshore UK for correctly finding hydrocarbons and classifying subsurface lithology. Adrok sign-up Strategic Partnership deal with an Oil Company in the Middle East. Adrok locates subsurface industrial elements in Canada. Adrok sponsors “The 31st Annual Dinner of the Scottish Oil Club 13th March 2009” at the Sheraton Grand Hotel & Spa, Edinburgh. Adrok makes Presentation at PETEX 2008 conference in Olympia, London. Adrok locates precious minerals beneath lake and onshore North America for an international Mining Company. In North Africa an Operator drilled and discovered a gas field on a prospect which Adrok’s ADR scanner had previously demonstrated would contain commercial gas reserves. Adrok completes Scottish Executive SPUR award. Journal of Translational Medicine publishes Adrok’s CJD collaborative research with the University of Edinburgh and the Scottish National Blood Transfusion Group.